Smoke and Mirrors: Has The Patriot Act Metamorphosed into The Freedom Act? Has The Patriot Act Metamorphosed into The Freedom Act? Not so fast! The spotlight is on one agency, the NSA and one expiring unconstitutional body of legislation, the Patriot Act. when they have all sorts of other ways to collect the same kind of intelligence laid out in the original Patriot Act, when there are countless other, even more powerful agencies than the NSA. It's what the profit-seeking "news" media, owned and run by a tiny elite, obscures that leads to truth. The massive US intelligence apparatus (see above) has already figured out how to get what it needs through other means. Broadcasting the curbing of the NSA Surveillance Program just gives we, the people false hope that's something is being done. In fact, under the Freedom Act, the program of domestic mass surveillance will only intensify. 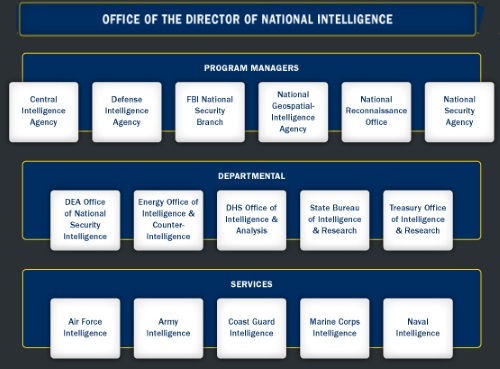 The NSA is only one of the alphabet agencies under the umbrella of the colossal Defense Intelligence Agency (DIA). It's all a game of smoke and mirrors to mask the ever-growing build-up of the surveillance and security industrial complex. This change they're trumpeting is purely cosmetic. It's basically the transference of responsibility for the retention of cell phone metadata from the NSA to telecommunication companies which now require the NSA to get a FISA stamp of approval before obtaining call records. What about all of the spy planes equipped with technology capable of tracking and reviewing data from tens of thousands of phones in a single flight and provided to the Department of Justice, including agencies such as the FBI, DEA, ATF, etc.? “The thing is, when you fly planes in the U.S., you have to fill out lots of official forms that become part of the public record. Because the FBI didn’t want to publicly acknowledge it was sending “spy planes” out to circle American cities (and potentially alert its targets), it created front companies for them. It seems the FBI is uncreative when it comes to spy craft; the fake companies tracked down by the AP and by Wiseman mainly had three-letter names, including FVX Research, KQM Aviation, NBR Aviation and PXW Services. Because flight records in the U.S. are public, and planes are trackable on radar, the AP was able to track down where these planes flew. Even politicians who speak out against the ever growing surveillance state cannot be trusted. Take Rand Paul who claims victory of the expired Patriot Act "proposed hiring 1,000 new FBI agents to track potential terrorists." Anyway, what do you need the NSA for when you've got Google and Apple and Amazon and Facebook? Newsflash: Big corporations and government are in bed together and cozier than ever. They don't even try to hide it anymore, what with Citizens United, huge corporate bailouts, not to mention corporations actually write the laws that government officials don't even read. Of course, I could go on forever but that should be enough to make one, at the very least, suspicious. EPIC is an independent non-profit research center in Washington, DC. EPIC works to protect privacy, freedom of expression, democratic values, and to promote the Public Voice in decisions concerning the future of the Internet. “The top-secret PRISM program allows the U.S. intelligence community to gain access from nine Internet companies to a wide range of digital information, including e-mails and stored data, on foreign targets operating outside the United States. The program is court-approved but does not require individual warrants. Instead, it operates under a broader authorization from federal judges who oversee the use of the Foreign Intelligence Surveillance Act (FISA). Some documents describing the program were first released by The Washington Post on June 6.